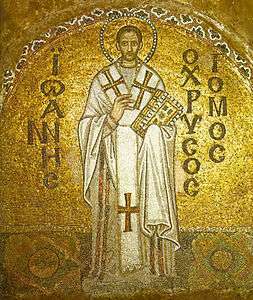 This article is about the 12th-century Byzantine Emperor. 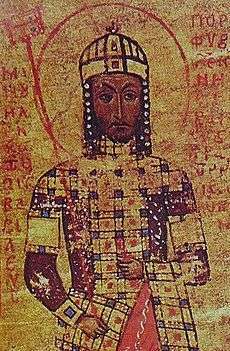 For the eldest son of Andronikos I Komnenos and father of Alexios I of Trebizond, see Manuel Komnenos (born 1145). Eager to restore his empire to its past glories as the superpower of the Mediterranean world, Manuel pursued an energetic and ambitious foreign policy. 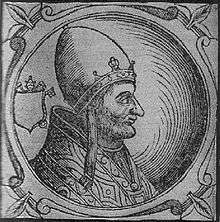 In the process he made alliances with the Pope and the resurgent West. He invaded the Norman Kingdom of Sicily, although unsuccessfully. The passage of the potentially dangerous Second Crusade was adroitly managed through his empire. 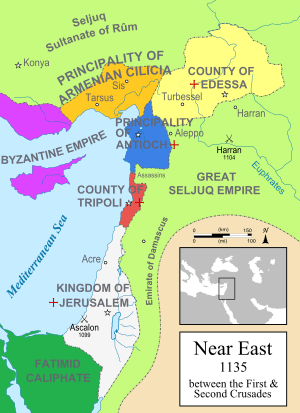 Manuel established a Byzantine protectorate over the Crusader states of Outremer. Facing Muslim advances in the Holy Land, he made common cause with the Kingdom of Jerusalem and participated in a combined invasion of Fatimid Egypt. Manuel reshaped the political maps of the Balkans and the eastern Mediterranean, placing the kingdoms of Hungary and Outremer under Byzantine hegemony and campaigning aggressively against his neighbours both in the west and in the east. The empire that Manuel inherited from his father had undergone great changes since its foundation by Constantine, eight centuries before. In the time of his predecessor Justinian I (527–565), parts of the former Western Roman Empire had been recovered including Italy, Africa and part of Spain. However, the empire had diminished greatly following this, the most obvious change had occurred in the 7th century: the soldiers of Islam had taken Egypt, Palestine and much of Syria away from the empire irrevocably. They had then swept on westwards into what in the time of Constantine had been the western provinces of the Roman Empire, in North Africa and Spain. In the centuries since, the emperors had ruled over a realm that largely consisted of Asia Minor in the east, and the Balkans in the west. 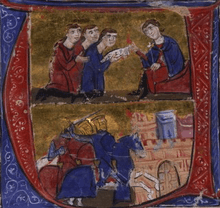 In the late 11th century the Byzantine Empire entered a period of marked military and political decline, which had been arrested and largely reversed by the leadership of Manuel's grandfather and father. Yet the empire that Manuel inherited was a polity facing formidable challenges. 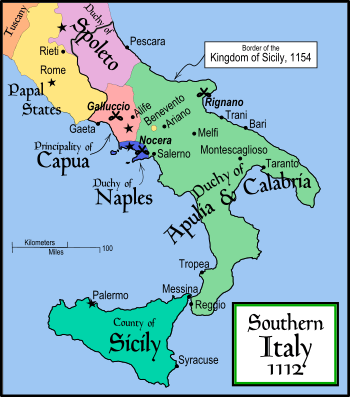 At the end of the 11th century, the Normans of Sicily had removed Italy from the control of the Byzantine Emperor. The Seljuk Turks had done the same with central Anatolia. And in the Levant, a new force had appeared – the Crusader states – who presented the Byzantine Empire with new challenges. Now, more than at any time during the preceding centuries, the task facing the emperor was daunting indeed. For more details on this topic, see Second Crusade. After 1158, under the new conditions, the aims of the Byzantine policy changed. Manuel now decided to oppose the objective of the Hohenstaufen dynasty to directly annex Italy, which Frederick believed should acknowledge his power. When the war between Frederick I Barbarossa and the northern Italian communes started, Manuel actively supported the Lombard League with money subsidies, agents, and, occasionally, troops. The walls of Milan, demolished by the Germans, were restored with the aid of the Byzantine Emperor. Frederick's defeat at the Battle of Legnano, on 29 May 1176, seemed rather to improve Manuel's position in Italy. According to Kinnamos, Cremona, Pavia, and a number of other "Ligurian" cities went over to Manuel; his relations were also particularly favourable in regard to Genoa and Pisa, but not to Venice. In March 1171 Manuel had suddenly broken with Venice, ordering all 20,000 Venetians on imperial territory to be arrested and their property confiscated. Venice, incensed, sent a fleet of 120 ships against Byzantium. Due to an epidemic, and pursued by 150 Byzantine ships, the fleet was forced to return without great success. In all probability, friendly relations between Byzantium and Venice were not restored in Manuel's lifetime. For more details on this topic, see Battle of Myriokephalon. Manuel made serious tactical errors, such as failing to properly scout out the route ahead. These failings caused him to lead his forces straight into a classic ambush. 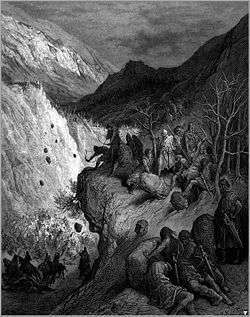 On 17 September 1176 Manuel was decisively defeated by Seljuk Sultan Kilij Arslan II at the Battle of Myriokephalon (in highlands near the Tzibritze pass), in which his army was ambushed while marching through the narrow mountain pass. The Byzantines were too dispersed, and were surrounded. The army's siege equipment was quickly destroyed, and Manuel was forced to withdraw – without siege engines, the conquest of Iconium was impossible. According to Byzantine sources, Manuel lost his nerve both during and after the battle, fluctuating between extremes of self-delusion and self-abasement; according to William of Tyre, he was never the same again. 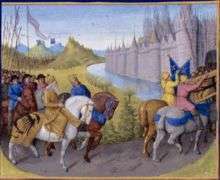 The terms by which Kilij Arslan II allowed Manuel and his army to leave were that he should remove his forts and armies on the frontier at Dorylaeum and Sublaeum. Since the Sultan had already failed to keep his side of the earlier treaty of 1162, however, Manuel only ordered the fortifications of Sublaeum to be dismantled, but not the fortifications of Dorylaeum. Nevertheless, defeat at Myriokephalon was an embarrassment for both Manuel personally and also for his empire. The Komnenian emperors had worked hard since the Battle of Manzikert, 105 years earlier, to restore the reputation of the empire. Yet because of his over-confidence, Manuel had demonstrated to the whole world that Byzantium still could not defeat the Seljuks, despite the advances made during the past century. In western opinion, Myriokephalon cut Manuel down to a humbler size: not that of Emperor of the Romans but that of King of the Greeks. The defeat at Myriokephalon has often been depicted as a catastrophe in which the entire Byzantine army was destroyed. Manuel himself compared the defeat to Manzikert; it seemed to him that the Byzantine defeat at Myriokephalon complemented the destruction at Manzikert. In reality, although a defeat, it was not too costly and did not significantly diminish the Byzantine army. Most of the casualties were borne by the right wing, largely composed of allied troops commanded by Baldwin of Antioch, and also by the baggage train, which was the main target of the Turkish ambush. The limited losses inflicted on native Byzantine troops were quickly recovered, and in the following year Manuel's forces defeated a force of "picked Turks". John Komnenos Vatatzes, who was sent by the Emperor to repel the Turkish invasion, not only brought troops from the capital but also was able to gather an army along the way, allowing him to score a victory over the Turks at the Battle of Hyelion and Leimocheir, a sign that the Byzantine army remained strong and that the defensive program of western Asia Minor was still successful. After the victory on the Meander, Manuel himself advanced with a small army to drive the Turks from Panasium, south of Cotyaeum. In 1178, however, a Byzantine army retreated after encountering a Turkish force at Charax, allowing the Turks to capture many livestock. The city of Claudiopolis in Bithynia was besieged by the Turks in 1179, forcing Manuel to lead a small cavalry force to save the city, and then, even as late as 1180, the Byzantines succeeded in scoring a victory over the Turks. 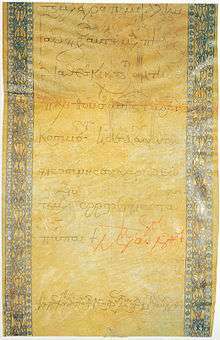 ↑ Letter by the Emperor Manuel I Komnenos, Vatican Secret Archives. Archived February 2, 2007, at the Wayback Machine. ↑ D. Obolensky, The Byzantine Commonwealth, 299–302. ↑ M. Angold, The Byzantine Empire, 1025–1204, 177. ↑ P. Magdalino, p. 279. 1 2 Gibbon, The Decline and Fall of the Roman Empire, p. 74. 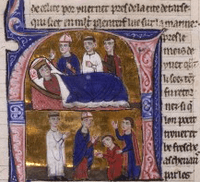 ↑ Robert of Clari, "Account of the Fourth Crusade", 18 Archived February 13, 2005, at the Wayback Machine. Jeffreys, Elizabeth; Jeffreys Michael (2001). "The "Wild Beast from the West": Immediate Literary Reactions in Byzantium to the Second Crusade" (PDF). The Crusades from the Perspective of Byzantium and the Muslim World edited by Angeliki E. Laiou and Roy Parviz Mottahedeh. Dumbarton Oaks Research Library and Collection. ISBN 0-88402-277-3. Každan, Alexander P.; Epstein, Ann Wharton (1990). "Popular and Aristrocratic Popular Trends". Change in Byzantine Culture in the Eleventh and Twelfth Centuries. University of California Press. ISBN 0-520-06962-5.